Around the corner from the Louvre, Le Nolinksi might sit on the tourist-choked Avenue de l’Opéra, but it’s so subtle that blink and you’ll miss it. For its first Parisian hotel - following the Hameau de la Volière in Courchevel - Evok Hôtels Collection tasked Jean-Louis Deniot, whose projects include the glamorous Chanel spa at the Ritz, to transform the Haussmannian building, which formerly housed offices. A swanky yet subdued sparkly gem of mirrors, polished brass fixtures, opulent fabrics, and petrol blue hues, the hotel fuses Gulf-style luxury with Parisian scale and a twinkle of 30s South Floridian Art Deco. Features like a magnificent green Carrara marble reception counter, celestial cloud frescoes swirling up through the six-storey staircase, and bolts of unexpected colour on each floor, bring a stylish kooky edge. Serving bistronomie cuisine, the brasserie Réjane has a futuristic garden patio theme helmed by a white-leaf tree and opens onto the bustling avenue. More intimate, the salon behind the restaurant is a retreat of cushy Danish 50s-inspired armchairs and velvet banquettes against artfully hand-painted silver walls. Just as warm and inviting, the guestrooms come with snug fabrics and hand-woven rugs, while tailor-made curved varnish wood wardrobes and brass flower-stand side tables contribute to the homely feel. And bringing new meaning to the ‘boutique’ hotel, guests can buy most items. In the basement, the candle-lit spa by La Colline draws guests into an otherworldly ambience. 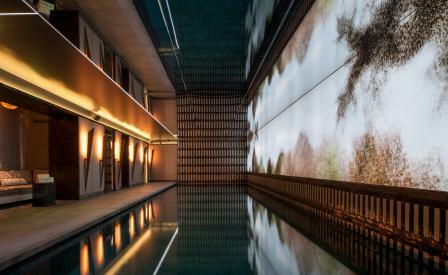 Dark and restful, the pool, a cool slab of still water, reflects in the mirrored ceiling while a backlit panel evokes swaying tree tops.